Large Beige & Red Tartan Snuggle Dog Bed - Danish Design Newton Moss 89cm - 34"
Home > Large Beige & Red Tartan Snuggle Dog Bed - Danish Design Newton Moss 89cm - 34"
A soft, warm snuggle bed for dogs and cats. Made in a hardwearing fabric with stylish stag head feature leather badge. Hand wash only or hand wash machine cycle - do not tumble dry. 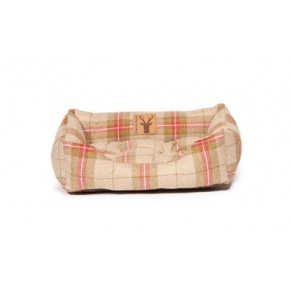 Small+ Brown Tartan Snuggle Dog Bed - Danish Design Newton Truffle 46cm - 18"
Medium Brown Tartan Snuggle Dog Bed - Danish Design Newton Truffle 61cm - 23"
Small+ Beige & Red Tartan Snuggle Dog Bed - Danish Design Newton Moss 46cm - 18"
Medium Beige & Red Tartan Snuggle Dog Bed - Danish Design Newton Moss 61cm - 23"
Medium+ Beige & Red Tartan Snuggle Dog Bed - Danish Design Newton Moss 68cm - 28"
Medium+ Brown Tartan Snuggle Dog Bed - Danish Design Newton Truffle 68cm - 28"